International Women's Day is a global day celebrating the economic, political and social achievements of women past, present and future. On March 8, the Tri-Cities Chamber is excited to host our 5th annual International Women's Day celebration. The celebration will start with a delicious lunch and keynote address from Olympian and Mental Health Advocate, and author, Leah Pells, RCC. The keynote address will be followed by a moderated panel discussion from local women of influence and how they strike a balance in their lives and career. Share how you advocate for gender parity by participating in our annual International Women's Day social media campaign. Put your hands out and strike the #BalanceforBetter pose and share with us how you encourage a gender-balanced world. Leah Pells is a mom, clinical counsellor, three time Olympian and published author. She is also an outstanding author, her book, Not About The Medal, is her story of love and addiction. Currently, Leah is a school counsellor in Suwa’lkh, an indigenous educational program in Coquitlam for students in grades six to 12. Leah found solace in running at an early age, she developed a passion for running in the peaceful isolation of Langley’s quiet country roads. When her parents divorced, her mother sunk into a destructive alcoholic state. Running became her way of coping. The adversity she faced strengthened her resiliency and fueled her athleticism. 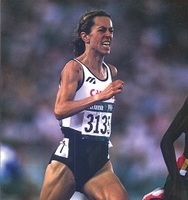 Her running career extended into her late thirties. Pells represented our country at six world track and field championships, three Commonwealth Games and numerous cross-country championships, earning awards and accolades throughout her competitive running career.